Join us for the launch party of Intoxicated - Feminine art by millennials curated by Babe Studio’s Mercedes Workman & Gabrielle Hall. Launch party - Friday April 5th 6-9pm at Urchin Wines. All welcome! Fully immersive night of arts and culture celebrating female millennials. Costume, film, photogrpaphy, fine art, print, sculpture. After party at the Tom Thumb from 9pm until late. Urchin wines are also launching their refill takeaway wine bottles with delicious consciously made red and white wines. Poet Ellie Ward is back in collaboration with Babe Studios to bring you the INTOXICATED POETRY SLAM !! It will be held at Urchin Wines in amongst Babe Studio's latest exhibition. 10 poets will have 3 minutes each to compete for the Intoxicated title. Each poet will perform their piece and then be scored by 3 random members of the audience. The highest score wins ! Ellie will host and do plenty of POEMS and we will all drink some WINE! POEMS MUST BE RELATED (in any way)TO THE THEME OF INTOXICATION !! BIG prizes to be announced ! Comment on the page below or email info@babestudio.co.uk to sign up for a slot - only ten slots available so sign up before it's too late ! We are re-booting our Sunday gig sessions with two brilliant local musicians, Rondo Mo and JAKL. Both playing live sets of their beautiful and ethereal new material. Come hang out, listen to some delicious sounds, read the Sunday papers, have a bloody mary and eat some tasty home cooked delights. Sunday sorted! Local wallpaper designer Erica Wakerly will be launching her new collection of wallpaper with a special series by Polly Dunbar, the children’s book author and illustrator. The exhibition will run for the month. “Modernsurface are proud to celebrate the launch of the Polly Dunbar Decoration interior design collection “Wallflowers". The acclaimed children’s writer and illustrator Polly Dunbar presents her captivating and exquisitely designed wallpapers to delight both children and grown-ups. Lily Mixe & David Shillinglaw Exhibition - Dog tooth. Chicken Feet. An exhibition of artworks by David shillinglaw and Lily Mixe. There’s a long history of artist couples making artwork together, sharing the same living and working space will always influence and be influenced by one another. At a certain point that exchange can become a more direct focus and begin to push and pull each others work in new directions, playing with new ideas and new materials. David and Lily met when David painted over one of Lily’s murals. From day one the artists have been working over each other’s pieces, sharing spaces, and on occasion making murals and installations together. The artworks made for this show are all drawings, collages and assemblages. The works are remixes; cutting and pasting, destroying and creating things in a kind of game of dare, nothing is too planned or designed, the works have been made over months, growing like a garden of off-cuts and studio scraps. Deliberately cross pollinating and grafting ideas and materials, creating a condition for ideas and images to grow. At points the works are love letters to one another, at other times more like arguments. The title for the exhibition comes from a conversation about a fabric pattern design which has two names, one in English: Dog tooth, and another in French: Chicken feet. A brief argument over which was the correct name quickly came to define a constant playful misunderstand between the two artists, this has become an obscure personal metaphor for how so often we can be guilty of debating two sides of the same coin. Launch party - 1st February 2019 Join us for the launch party and re-opening of Urchin 6-9pm. The fun will then continue over the road at the Margate Arts club from 9pm until late. To kick Christmas off, we’d love for you to come join us on this Sunday before Christmas for mulled wine and music at Urchin Wines. Nibbles, music, booze and festivities. We will still be open for business so also a last chance to get your Christmas shopping in! This exhibition is curated by Sadie Hennessy and is an examination and celebration of dying and extinct holiday entertainments. It could be viewed as a metaphor for the decline of civilisation in the Anthropocene age…. or just enjoyed as a slice of seaside nostalgia. More here…. 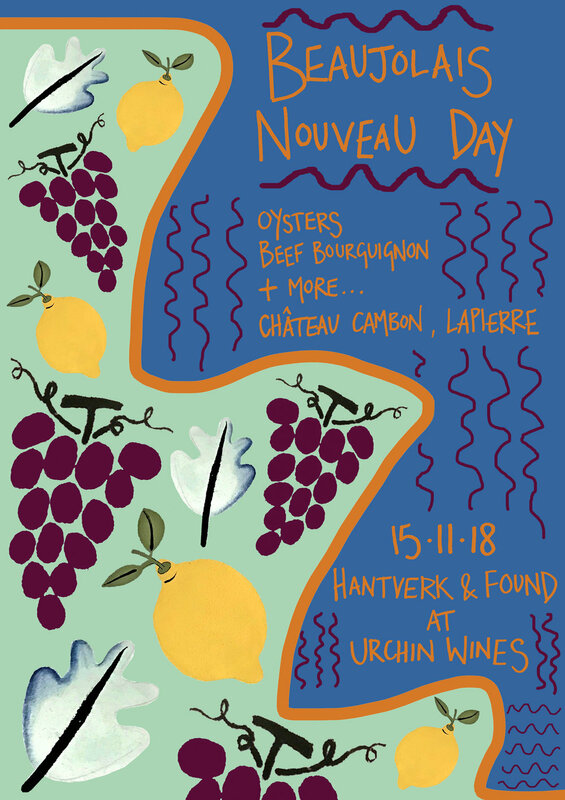 We are joining forces with Kate De Syllas from Hantverk & Found to bring your an evening of french delights for Beaujolais Nouveau Day on the 15th November. Beaujolais Nouveau from Château Cambon by Marcel Lapierre, deliciously fragrant and light. 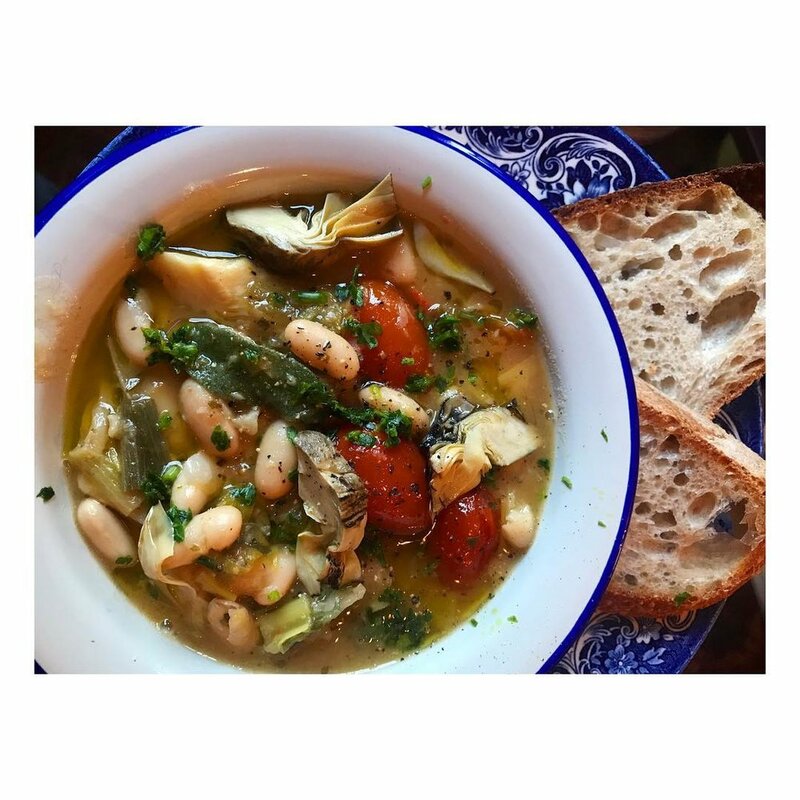 Menu for the evening will include Oysters, Beef Bourguignon, Delice de Bourgogne cheese and more…. For bookings, get in contact by emailing info@urchinwines.com. Writer Jenefer Odell will be curating a multi media exhibition at Urchin Wines during November. She is inviting artists, choreographers and film makers to respond to her poetry. The pieces will then be displayed side by side. Expect some live performance, a wide variety of mediums and themes of sexuality and womanhood. Parlour Noir brand owner; Jemelia, would like to invite you to her embroidery workshop as part of her exhibition currently on show at Urchin Wines. Enjoy an afternoon of hand embroidered letter and figure stitching. Take some time to view the exhibition and drink fine wine. All welcome, beginners to experienced. Our artists for October are the lovely local Poodle & Blonde and Parlour Noir, exhibiting ‘The Embroidered Interior’. More info here…. Reo Jewels new collection entitled 'Margate 2018' is inspired by Rebecca's move to the Kentish coastal town. Forever inspired by the natural world and days spent beach combing the shores of Margate, this new collection depicts seaside objects found along Thanets coastline and cast into precious jewels. Items such as shells, starfish and crab claws can be found amongst her work which is all cast in sterling silver and plated in 18ct yellow gold. Gems of the Sea such as Opals and Pearls are also used to reflect this theme. Exhibiting alongside is Charlotte Edey. An artist & illustrator working across print, tapestries and ceramics. 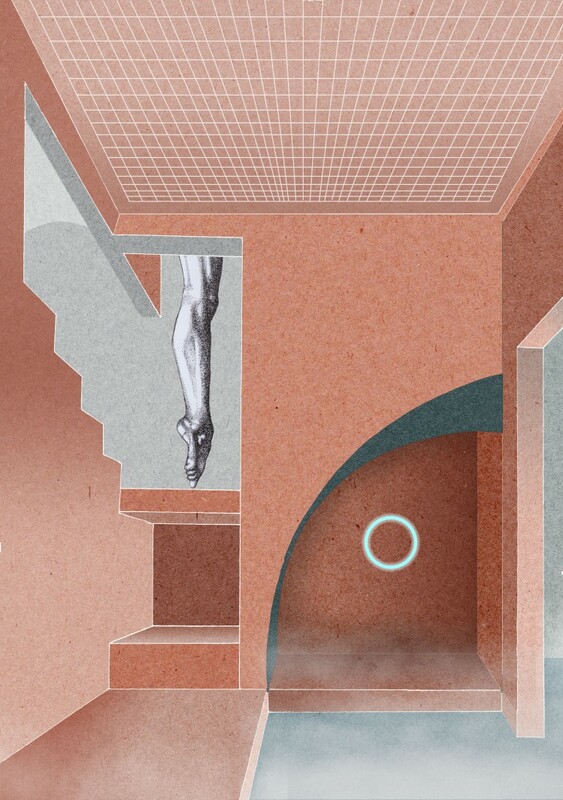 Softly surreal, the themes of identity and balance are explored within fluid and impossible spaces. 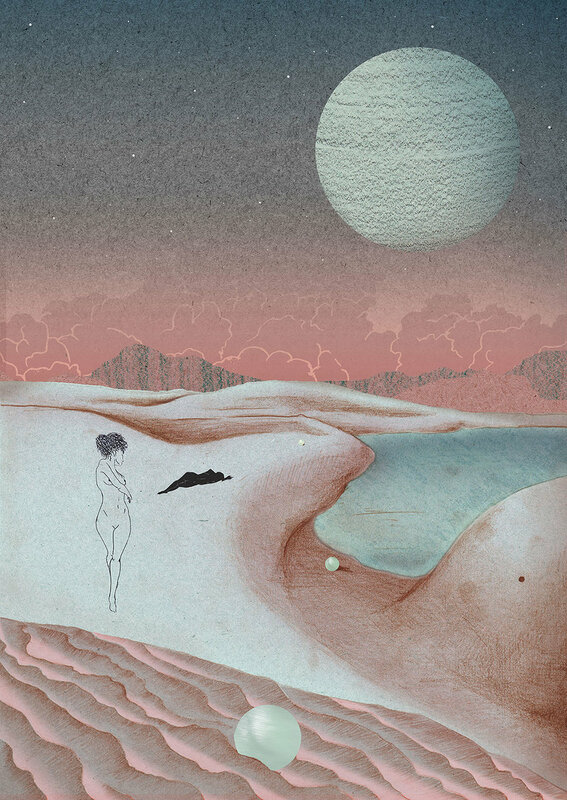 Drawing on modernist architecture, afrofuturism and vastly arid landscapes, the scenes are punctuated with touches of lush, organic idyll and miniature figures. This use of scale and visual contrasts explores the delicate and precarious nature of equilibrium. Her work has been exhibited across the UK at venues including The Oxo Tower & The Arnolfini alongside galleries across the USA, Russia and Europe. Charlotte was showcased as part of the Great Women Artists: Women on Instagram exhibition at Mother London and selected for the Artist of The Day 2018 exhibition at Flowers Gallery, Mayfair. Her work has been featured in Creative Review, Vanity Fair, It’s Nice That, i-D magazine, Dazed, AnOther Magazine, Country&Townhouse, Hunger and London Evening Standard. North London poet John Hegley, will be performing a preview of his Edinburgh fringe show at Urchin Wines on Sunday 29th July. Entertaining and thought-providing with some joining in. Devised largely for adults, but 9 year olds can come. Tickets are available here for the astonishingly great price of £10 per person. The show is set to be popular so purchasing tickets in advance is recommended to ensure entry. Join us on Friday the 13th of July for a live DJ set from acid house pioneer Adamski, known for his hit 'Killer' with Seal. Expect nostalgic dance tunes to kick off your Saturday night. Followed by a live performance from Sony Ericsson, Adamski's eccentric alter-ego. Free entry but limited space so get here early to make sure you catch it. 'By the Light of a Silvery Moon' is an exhibition of artwork by both Jon Spencer & Alessandro Cripsta. With an air of mystical, spiritual, historical and nostalgic ghostliness. "Alessandro Cripsta is an Illustrator and Graphic Artist. He creates suspended images that echo the collective unconscious, taking inspiration from ancient symbols and metaphysical paintings. Wide horizons where long shadows fall." Jon Spencer’s work is concerned with ideas of the layering of history; physically, emotionally and in terms of memories. He looks to tease out stories hidden in the fabric and collective memory of our urban environment, retelling them and prompting the viewer to look at their surrounds anew. For this show at Urchin, Jon is showing a set of his Bandstand Series. 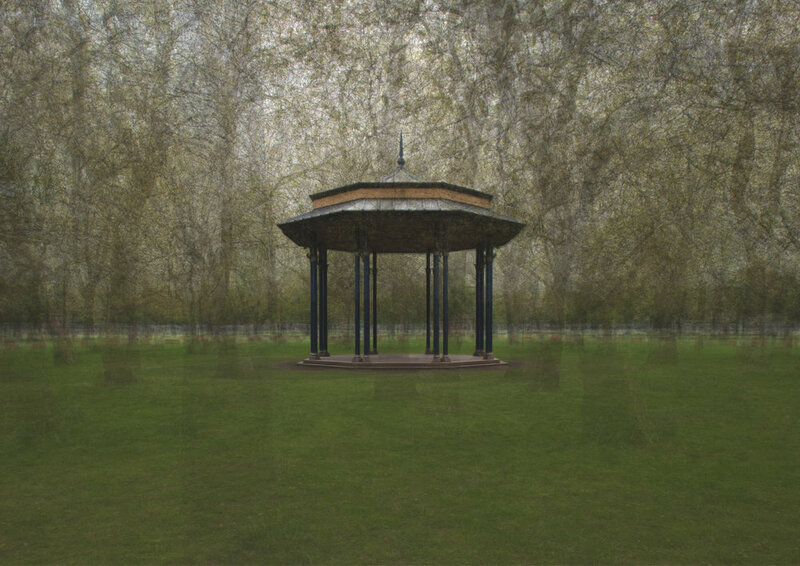 These layered, painterly images are created through a systematic process which plays on the symmetrical form of the Bandstands. Their ethereal nature creates a tangible sense of the passage of time, with contemporary figures appearing as ghosts of their Victorian or Edwardian forebears. Here we see the bandstands absorbing and reflecting the changes in their surroundings, whether as active centres of attention, or as dis-used and perhaps mis-used relics of the past. Jon will also be showing a few pieces from his new work, By the Light of a Silvery Moon. Here original black & white postcards of traditional English seaside resorts are inter-inlaid with bejewelled & saturated versions of the same image created by the commercial retoucher's brush a few years distant. We jump between a straightforward day time view and one where windows glow, festoons light up or are invented and more often than not a silvery moon appears in the sky. 6 glasses of wine, each introduced with a bit of background behind them. 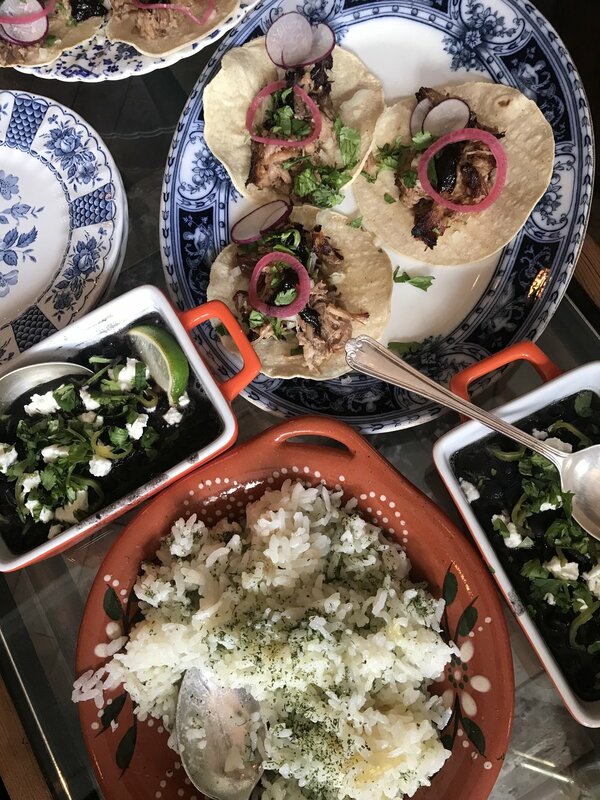 Informal tasting, so you don't feel like you have to sit there studying. ‘Start Your New Life Today’ - collaborative exhibition between Charlie Evaristo Boyce and Gus Sharpe. Showcasing a new range of works by both artists. Exploring pathways of portraiture and printing methods along side reinvention of popular imagery, with some twists to the works. It'll also be Minnie's birthday weekend so we'll be celebrating! Join us for an evening tasting a selection of English Sparkling wines. English wine makers are going from strength to strength, we will be showcasing some of our favourites from 2018 - local Kentish wines included. 6 glasses of sparkling wine, each introduced with a bit of background behind them. Falle Nioke live at Urchin Wines. West African musician Falle incorporates …. Margate Artist Hayden Kays will be our exhibiting artist for May with a collection of prints called 'Sobering Thoughts'. Following on from 'Drink Drawings' that was exhibited at For. Fuk. Sake last month, wherby all work was made whilst under the influence. Harry from Very Friendly will be playing a live acoustic set on Sunday the 29th of April from 2-3PM. Spend a Sunday at Urchin Wines, learning how to create your very own moody blue, layered seascape or landscape based on Melanie's techniques.